When we first launched out small business, we quickly realized that there was an unexpected learning curve. We undeniably had a few lessons to learn. For one thing, cleaning an office space is a pain in the rump. Secondly, the technical and IT aspects of running a business are way more complicated than they look, and that’s coming from a group of people who review tech products for a living. Small business owners don’t have an infinite number of cash bundles to throw at IT employees. Setting up a printer network is more difficult than you might think, so hiring an IT professional is sometimes necessary. Most business-grade printer installations take considerably more time and effort than their consumer grade counterparts, mostly due to security concerns. The Xerox VersaLink C400 color printer fills a glaring gap in the small business electronic market: a user-friendly business printer. With their new line of VersaLink printers, Xerox aims to assist businesses who don’t have the resources required to hire a full-time IT staff. 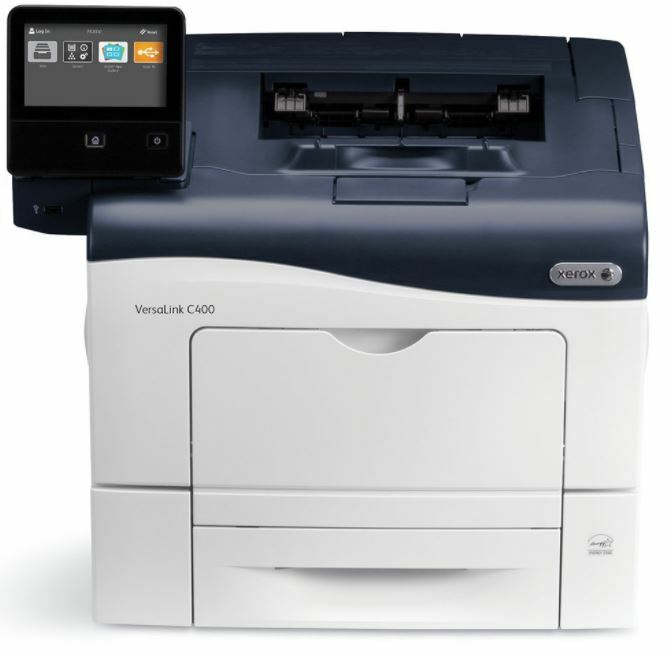 The VersaLink C400/N combines a user-friendly setup wizard with strong security and high-performance printing. The result is a printer that saves businesses money and eliminates the stress of hiring new staff. Over the past few weeks, we’ve had the chance to evaluate the C400 and see how it measures up to the competition. 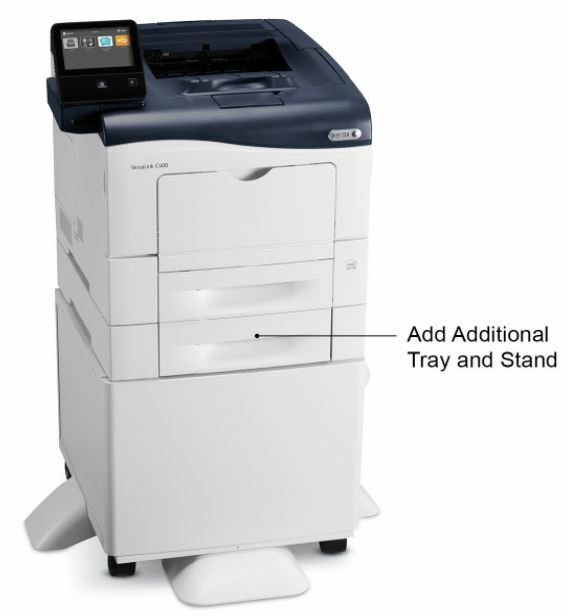 Xerox has included everything you need to quickly get your printer up and running. Included in the box is the color printer itself, a set of starter capacity ink cartridges (one of each, cyan, magenta, yellow, which all have a 2,000 print capacity and black, which has a 3,000 page capacity), a Software and Documentation CD which features all of the manuals, guides, safety information, printer drivers and warranty statement, an installation guide, a quick use guide and a power cord. Because of the printer’s size, removing the device from the box required a little jiggling, which is not entirely uncommon for large consumer electronics. The printer was very well-packaged, which is one of the reasons the device was so snug. 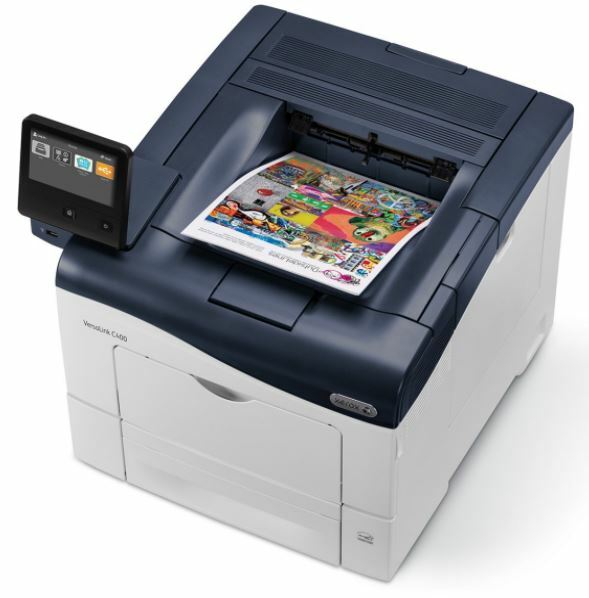 When compared to other business-ready printers, the C400/N is way easier to install. Once you’ve plugged the printer in and powered it on, the built-in setup wizard will guide you through the rest of the process. The installation wizard guides you through optimizing your printer’s security, connecting the printer to your network and customizing the printer for your needs. We found the setup to be seamless; a welcomed change from the typically frustrating experience printer setups can be. Once the printer is all setup, we recommend printing out a few additional test pages just to make sure that everything is formatted correctly. The setup wizard worked perfectly as far as calibration is concerned, but we’ve found that printers have a habit of being a little wonky right after installation. If you own a business which relies on heavy paper workflow, a printer with a slow ppm speed can not only be frustrating, but can cost you a ton of money in the long run. During our review, we found that the C400/N printed about 36 ppm for both black and color prints. For those with poor math skills, that’s more than one page every two seconds (as you can tell, paying attention during Calculus really paid off). 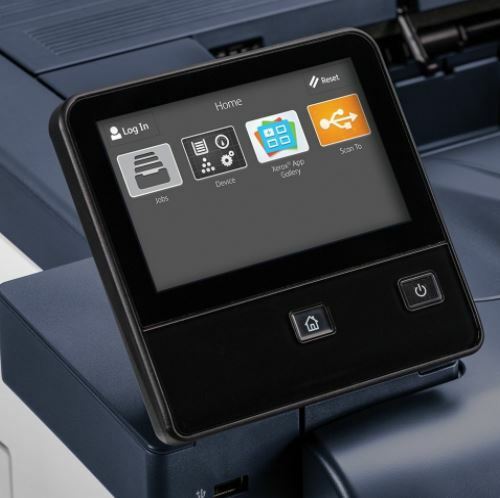 Some printers feature much faster print times for black prints, likely due to the way the printer handles the data, but the C400/N is an equal opportunity device. The printer takes about 12 seconds to print out the first page, but really starts spitting out pages quick once it starts rolling. One thing you’re going to want to keep in mind is that the C400/N does not feature two-sided printing. If two-sided printing is a must for your business needs, then you should take a look at the printer’s big sister, the Xerox C400/DN. Xerox clearly takes your business’s security concerns very seriously. The VersaLink C400/N offers a multi-layered approach to network security. Xerox focuses on intrusion prevention, device detection, document and data protection and third-party partnerships. Xerox accomplishes their approach by using a combination of effective processes, including local and LDAP user authentication, PIN secured prints, print and hold (which tells the printer to keep the document in its memory until you walk over to the printer and verify that you’re there to take the print), network authentication (to make sure it’s your network that is interacting with the device, hard drive overwrite, IP address filtering, access controls, role-based permissions, user IDs printed in the margins, common access card support, Cisco TrustSec ISE integration and 256-bit encryption. Xerox also allows access to their PrintSafe Software. We’re, admittedly, not world-renown hackers, yet we still tried our darndest to gain access to the printer from beyond the comfort of our network. There was absolutely no chance of us using our basic knowledge of printer security to break in. As far as we’re concerned, the C400/N is adequately secured, with features to spare. Printer security is of the upmost importance, since it is often used as a means for gaining access to your entire network. If you’re running a high-volume business, a low capacity paper tray can be very frustrating. Who has time to refill the tray several times per day? 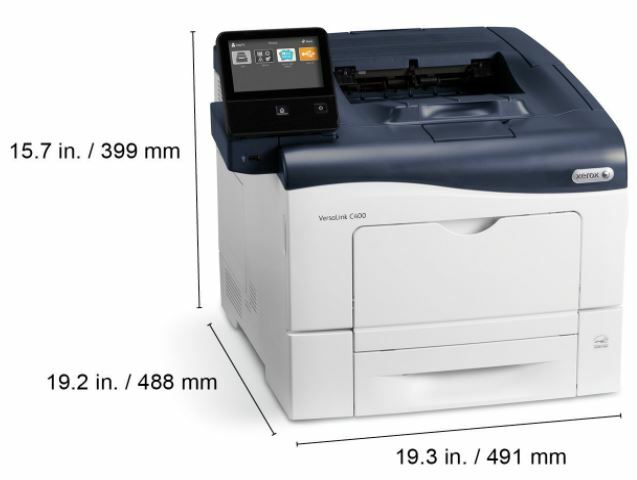 The C400/N features a 550 page tray, which is admittedly rather “meh” for a medium-scale business, though should be just fine for a small business as long as the small business isn’t a publishing company or something which requires a ton of paper turnover. The printout tray includes no finishing options, which is a bummer, but not a deal breaker, and totally expected at the price point. The printer’s maximum monthly duty cycle is 80,000 prints, which is about 2,700 pages per day. That’s a heck of a lot of paper. If you need this many prints per day, we’re guessing that your office has more than one printer anyway. The recommended monthly print volume is up to 5,000 pages, which is still realistic for a small business. The starter cartridge included with the printer won’t last you forever, so you might want to consider your cartridge options. Xerox offers branded cartridges in three different sizes: standard capacity, high capacity and extra high capacity. We did the math (still making that Calculus class work for us), and determined that the extra high capacity option was the best bang for your buck. Their largest cartridge size can print 10,500 black and white pages and 8,000 pages for each color. Some simple division will show that the extra high capacity cartridge is the best value, with a cost of 1.9 cents per black page and 12.6 cents per color page. Compared to the cartridge efficiency of other small to medium business printers on the market, the C400/N scores very high. The C400/N’s 5-inch capacitive color touch screen is easily one of the printer’s most impressive features. The on-board printing software uses a familiar smartphone-like user interface, which makes the controls easy for anyone to use. If you’ve ever used a printer with a touch display, the user interface can be pretty crummy, and that’s putting it gently. The large and vibrant C400/N screen is much prettier and much clearer than any of the competing options. The UI uses an intuitive hierarchal process which naturally moves the user through the desired features or functions. The controls feel well-thought out and practical. The touch screen supports gestural input and features task-focused apps that feature a consistent design. Well-designed printing software is hard to come by, by Xerox has done a very good job with their VersaLink line. Businesses are quickly adapting to the cloud and using it to optimize their business flow. Printing from multiple devices and through third-party cloud services is a vital feature for any current business printer. 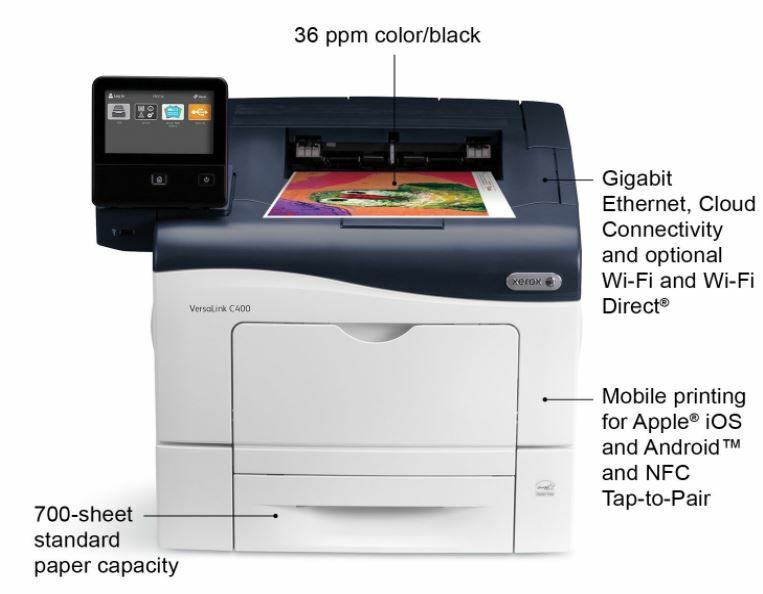 The VersaLink C400/N features optional WiFi or WiFi Direct, and support for Apple AirPrint, Google Cloud Print, Xerox’s Android Print Service plug-in, Near Field Communication (NFC) tap to pair and Mopria. All of the printing options are available right through the Xerox App Gallery. We found the C400/N’s wireless features to be seamless and dummy-proof. The printer’s awesome on-board software and touch screen make browsing service easy, and printing from cloud services is as easy as selecting the right printer. Not exactly rocket science. As you might expect, the VersaLink C400/N is a beast. You’ll definitely need to make sure you have enough space to account for this bad boy before you start pressing order buttons. The printer measures in at 19.3 in. x 19.2 in. x 15.7 in. and weighs a hulking 57 lbs. If you have any trouble carrying weight over 50 lbs. we recommend asking a friend to help. Don’t be a hero. The 550-page paper tray measures an additional 5.4 inches high and weighs an additional 8.6 lbs. The build quality of this printer is no joke. If you’re planning on cartoonishly throwing any pianos out of buildings, you’d easily be able to substitute the piano with the C400/N. The Xerox VersaLink C400/N is a great choice for a mid-level small printer for small- and middle-sized businesses. The set-up wizard makes setup and security simple, which is huge relief for a company short of IT resources. The fast print speed is quick enough to satisfy most business needs, the UI is intuitive and the build quality is seemingly designed to last through a nuclear war. If you’re looking for a printer that can handle two-sided prints, you’re out of luck with the C400/N model, but the upgrade models, the appropriately more expensive C400/DN offers that and a faster print speeds. If you’ve been browsing for a printer that’s not going to cause you any IT networking issues, the Xerox VersaLink C400/N is a good option, particularly for small businesses with an average to below average print capacity.